The moment I gave birth to my first baby, I also gave birth to myself. I was transformed. Nothing would ever be the same again. That was thirty-eight years ago. Two years ago, my daughter gave birth and I remembered how much I loved being pregnant, loved giving birth. Then when my daughter-in-law gave me the honor of being by her side for the birth of my second grandchild, again, I was transformed. I knew my life was about to take another turn. I was going to become a doula. Supporting women giving birth, I was most struck by their immense, innate power. However, they often were directed to go against their instincts during the birthing process, forced to not trust their own bodies. This is what drew me to HypnoBirthing. Studying HypnoBirthing, I found the tools to help my clients benefit from this natural childbirth philosophy. After clients have taken HypnoBirthing classes, I know they come out confident and completely able to trust their own bodies. I believe this is the key to a joy filled, calm experience of birth. My extensive background in yoga and mindfulness training has proven to be the perfect complement to using HypnoBirthing’s techniques of hypnosis, breathing, visualization and relaxation with clients. I am there to help with establishing a solid practice in these techniques and to insure that they are well-established when the big moment comes. My goal is to encourage and remind birthing women and their partners to remain in their safe place; breathing in a way that relaxes, not strains; to take different positions for ease and for the gentle facilitation of bringing the baby down; and to imagine the perfect opening of their bodies to welcome their newborn to the world. Please email info@hypnobirthingny.com to check on Caren's availability for your birth. I have worked in women's health for many years and have always been fascinated with pregnancy and birth. After many years as a childcare provider for newborns and infants, I made the change to become a doula. My choice was solidified after the birth of my niece - seeing how amazing and powerful my sister was. I am elated to devote my time supporting and encouraging mothers and families as they prepare to welcome a new member to their family. As a doula, I aim to guide you through labor and birth through providing a calm, supportive, and encouraging environment using methods of HypnoBirthing. Learned breathing techniques along with visualizations and imagery aid in guiding the mind and body to relax, building confidence, and releasing tension. This leads to a more peaceful and carefree birth experience. Please email info@hypnobirthingny.com to check on Erica's availability for your birth. I am a certified Birth and Postpartum Doula with Doulas of North America (DONA). I am also certified as a Lactation Counselor through the Healthy Children’s Center for Breastfeeding. I recognized the absolute necessity for physical, emotional, and informational support during the labor process and the early postpartum period after my own two challenging births and recoveries. An amazing Postpartum Doula guided me from a place of anxiety and uncertainty to being a strong and confident new mother. This experience also planted the seed for my desire to give this same support and guidance to women and families during this precious time. My two sons are young adults now, but I can still close my eyes and see my Doula’s face; that is how important her support was to me. I truly enjoy continuing my education in birth and postpartum care through workshops and training. The techniques and practices used in Hypnobirthing particularly interest me and I believe they bring a unique and simplistic yet effective tool to the birth setting regardless of where it takes place. 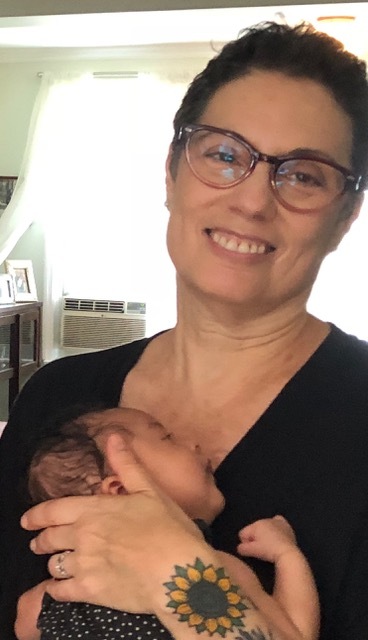 I have seen firsthand how Hypnobirthing practices can keep a couple calm and focused when I worked with a couple during a particularly challenging labor course (which ended in a Cesarean birth due to a medical crisis). I am excited to come along side birthing families and support them in this way. Please email info@hypnobirthingny.com to check on Janet's availability for your birth. Copyright 2018 - HypnoBirthing NY. All Rights Reserved.